To listen to a compilation of Phone Seminars including a recording Sue Gregg talking with Marilyn regarding Whole Grains CLICK HERE. Thursday, May 3, we talked with Sue Gregg regarding her new book, An Introduction to Whole Grains. 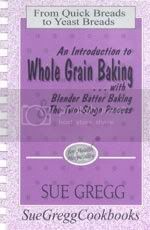 This new book is designed to be the text book that goes with the Baking With Whole Grains Curriculum, as well as a complete cookbook on blender batter baking and the two-stage process for quick breads and yeast breads. Sue explained the benefits of the two-stage process both nutritionally and as a convenience to the cook. One of the benefits of soaking flour is the enzymes are activated that promote digestion of the grain, and the phytates are neutralized releasing a high percentage of the minerals that would otherwise be bound up. Sue also described her Taste and Tell Recipe Sampler recipes and some of her favorite recipes from each of the different books in the series. We wrapped up the hour with Sue answering audience questions. Including Sue's new book, An Introduction to Whole Grains, this popular 6-book set PLUS this long-awaited new book is on sale for $92.00 (reg. $116) with F.REE shipping!